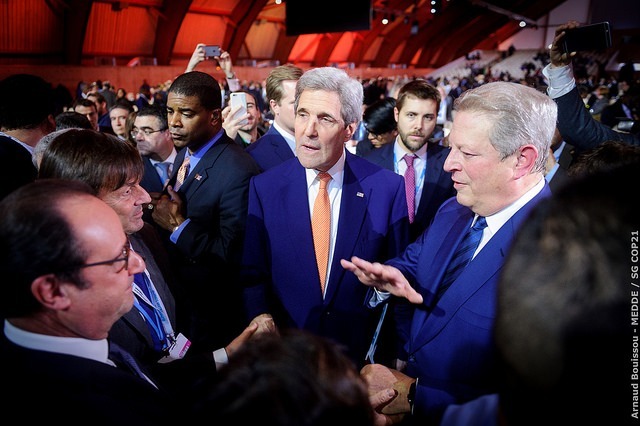 The COP21 Climate Agreement: What Does It Mean for the United States? There are few examples in recent times of the world’s countries coming together to agree on actions that have profound global and long-term consequences — the United Nations, Bretton Woods and the World Trade Organization are among the most notable instances. In each case, the parties put aside parochial differences and produced agreements that have stood the test of time and had positive consequences far beyond original hopes. The 2015 United Nations Climate Change Conference, commonly referred to as COP21, should be considered to be of similar historic importance. The final Paris Agreement includes three main components, each of which marks a first for the global community. All countries pledge to pursue all measures to keep the earth’s temperature rise below 2 degrees Celsius, in addition to aspiring to an even more ambitious target of a 1.5-degree limit. The developed world will assist developing countries to achieve their targets. That may include financial, technology or other support. We are already seeing the decline of coal; this will accelerate. New chemical and industrial processes will emerge around lowering CO2 footprints (very likely at lower cost). Renewable energy and storage will continue to gain momentum, as long as efficiency and costs continue to improve. Shipping will become more efficient (larger ships, better fuel economy). On-shoring of manufacturing will increase, as transportation is a very large contributor to CO2 emissions. The Corporate Average Fuel Economy (CAFE) standards are already driving U.S. CO2 emissions in the right direction, and they will become more demanding as new technology (such as engine efficiency and lightweight materials) drives progress. Public investment funds will focus more on CO2 portfolios and will include more energy and infrastructure; they will also include CO2 “sinks” as a more strategic approach to sustainable forestry and even reforestation, which have become critical as temperature increases in the tundra could release huge CO2 emissions that are currently sequestered. Additional risk capital will also be attracted to the opportunity, despite the poor returns of the past few years. In each of these areas, and many others, the United States has a huge opportunity for technology and commercial leadership. This will drive investor returns and attract significant capital to the challenge, representing a virtuous circle. With China now able to make similar massive financial bets, the American government would be well advised to take the lead and extend the competitive position of U.S. industry. For Lehigh Technologies, the CO2 targets provide further support for our simple value proposition of lower cost, equal or better performance, and “green for free.” We will expand our long-term efforts to deliver improved sustainability benefits, helping our customers across sectors play an important role in reducing CO2 emissions while gaining meaningful cost reductions. The COP21 Agreement has brought moral authority to the world stage, and this alone will drive commitment and progress. As with many peaceful revolutions, the return on investment of new technologies will play a key role in delivering the results. Alan Barton is the CEO of Lehigh Technologies. He has led Lehigh since 2008 and has spearheaded expansion into new markets around the world. He has more than two decades of experience in the specialty chemicals industry, including over a decade of management experience. Alan was previously executive vice president at chemicals giant Rohm and Haas, where he led the company’s global coatings businesses. He began his 23-year career at Rohm and Haas in research and development before being promoted into larger management roles in both Europe and the United States. While at Rohm and Haas, Alan also led the company’s sustainable development efforts. Alan holds an undergraduate degree from University College, Oxford, and a Ph.D. in chemistry from Harvard University.